At ASQ, we often talk about giving the gift of quality—that is, the gift of knowledge and tools one needs to practice quality. ASQ also offers tangible gifts for the quality professional. If you’re searching for a creative or unique gift for a colleague, friend, or boss, we have a few suggestions—from popular books to a membership to a phone case to ASQ golf balls (yes, golf balls). 1. The Quality Toolbox, Second Edition. This book is always a favorite colleague gift for those starting out in the field, and a timeless refresher for everyone else. 2. An ASQ membership. This could be a good gift for everyone from students and interns to seasoned professionals. Choose from a student, associate, or a full membership. 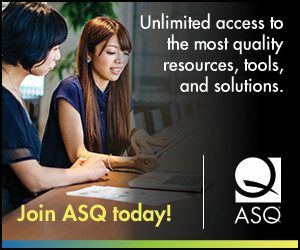 Along with all the benefits of a membership, ASQ members receive a free monthly gift bundle on a “hot” quality topic, such as the ISO 9001 revision. 3. ASQ phone case. Or a sweatshirt. Or a bag. Or a pen, a hat, a T-shirt, or golf balls. Did you know that you can get a variety of fun, small gifts with the ASQ logo? See our store for ASQ accessories, office gear, and clothing. 4. The ASQ Quality Improvement Pocket Guide. This inexpensive pocket guide is a quick, on-the-job reference for anyone interested in making their workplace more effective and efficient. It’s a great gift for quality newbies. 5. Quality Press Gift Certificate. If you’d like the recipient to choose his or her own book, give a gift certificate to the Quality Press bookstore. The certificate can be redeemed for any of ASQ’s print or e-books, as well as standards and journals. Previous Previous post: Is Quality Ambitious Enough? Next Next post: November Roundup: What Does Leadership Mean to Quality?